QR Inventory is an online, barcode scanning inventory and asset management software with mobile inventory processing. Traditional inventory management systems use barcode scanners to process asset and inventory transactions. This may work fine if your inventory and assets are near the computer to which barcode scanners are connected. But what if this is not the case? What if your inventory is located in the places far away from the office computers: in the field, on the service vans, on the job sites, at the customer locations, etc. Barcode scanner based inventory management will not work in these situations, but QR Inventory will. QR Inventory uses regular smartphones as both scanners and mobile computers. Your employees can use their own smartphones to scan QR code or barcode on the label and process asset or inventory transaction. They can do it at any location that has Wi-Fi or cellular connection. You do not need to purchase expensive barcode scanners, even more expensive mobile computers and spend money on connecting purchased hardware to your network. 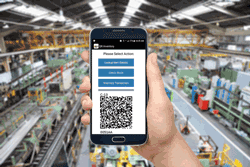 One scan of QR code label with a smartphone - and inventory or asset transaction is recorded, sent to the cloud and updated information is available to all authorized employees / devices in real time. This video shows how inventory transactions are processed using QR Inventory software and QR Inventory smartphone application (available for iPhone and android phones). QR Inventory has several distinctive features that set it apart, one of them is an ability to adjust QR Inventory to your business by creating custom transaction types, properties and custom fields. This video is a brief overview of the process. Typical transaction types that are built-in the most inventory software packages are restocking, sale and return. This may be good for a retail oriented business, but other businesses need much more than that. Are you a field service business who need to track assets and inventory between warehouse, job sites and service vans? Manufacturer who needs to record raw materials and finished goods production? Rental / leasing business who needs to record rentals and returns? Need to assign assets to employees and track who has what? QR Inventory covers it all, and more. You decide which transaction types to use for your business by creating them yourself via the web interface. The transaction types can be anything from check in and check out for the construction tools and office assets, to rent-out and return for rental assets, to transfer between locations, taking inventory out for a job, returning unused inventory, etc. for field service companies, and much more. In addition to creating custom transaction types, you can define what you want to track, report and record for different transaction types. For example, a field service business may need to keep track of jobs, projects and clients that materials were used for. Retail business may keep track of sales channels through which items are sold. An office may keep track of who checked out asset and when it is due back. A rental business may need to keep track of asset location, client and a due date. The list goes on and on... Whatever you want to keep track of during asset and inventory transactions, you can do it - create custom transaction properties via the web interface, and they will appear in a smartphone application for your employees to fill out. Filter reports by transaction properties, producing exact information you need. Want to attach specific data to your assets and inventory? Item specifications, emergency procedures, url to pdf documentation, user manual, images, anything else? Using QR Inventory, you can create custom fields to hold all information on your assets and inventory that you need, including images. Authorized employees can access this information in the field by scanning QR code label on the asset or inventory item with a smartphone.